Shoma (Masatake) Morita, M.D. (1874-1938) was a Japanese psychiatrist-professor who developed a unique four stage therapy process. He challenged psychoanalysts who sanctioned an unconscious or unconsciousness (collective or otherwise) that resides inside the mind. Significantly, he advanced a phenomenal connection between existentialism, Zen, Nature and the therapeutic role of serendipity. Morita is a forerunner of eco-psychology and he equalised the strength between human-to-human attachment and human-to-Nature bonds. This book chronicles Morita’s theory of "peripheral consciousness", his paradoxical method, his design of a natural therapeutic setting, and his progressive-four stage therapy. It explores how this therapy can be beneficial for clients outside of Japan using, for the first time, non-Japanese case studies. The author’s personal material about training in Japan and subsequent practice of Morita’s ecological and phenomenological therapy in Australia and the United States enhance this book. LeVine’s coining of "cruelty-based trauma" generates a rich discussion on the need for therapy inclusive of ecological settings. As a medical anthropologist, clinical psychologist and genocide scholar, LeVine shows how the four progressive stages are essential to the classic method and the key importance of the first "rest" stage in outcomes for clients who have been embossed by trauma. Since cognitive science took hold in the 1970s, complex consciousness theories have lost footing in psychology and medical science. 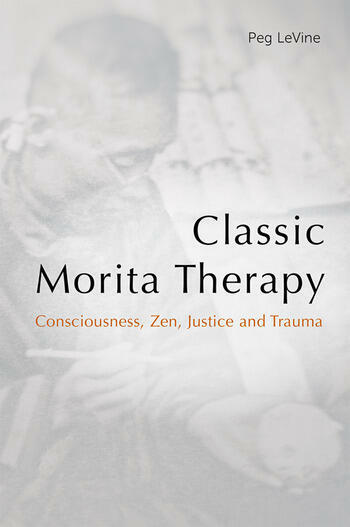 This book reinstates "consciousness" as the dynamic core of Morita therapy. The case material illustrates the use of Morita therapy for clients struggling with the aftermath of trauma and how to live creatively and responsively inside the uncertainty of existence. The never before published archival biographic notes and photos of psychoanalyst Karen Horney, Fritz Perls, Eric Fromm and other renowned scholars who took an interest in Morita in the 1950s and 60s provide a dense historical backdrop. Peg LeVine, Ph.D., Ed.D holds Australian and American citizenship. As Clinical Psychologist/Medical Anthropologist and Professor, she specializes in cruelty-based trauma fallout. She coined ritualcide in the genocide literature. Since her 2014-2015 Inaugural Fellowship at the Center for Advanced Genocide Studies (Shoah Foundation), she continues as a researcher. She was the first woman recipient of the Shoma Morita Prize (Tokyo, 2011). As a sculptor, Peg’s figurative work is existentially provocative.